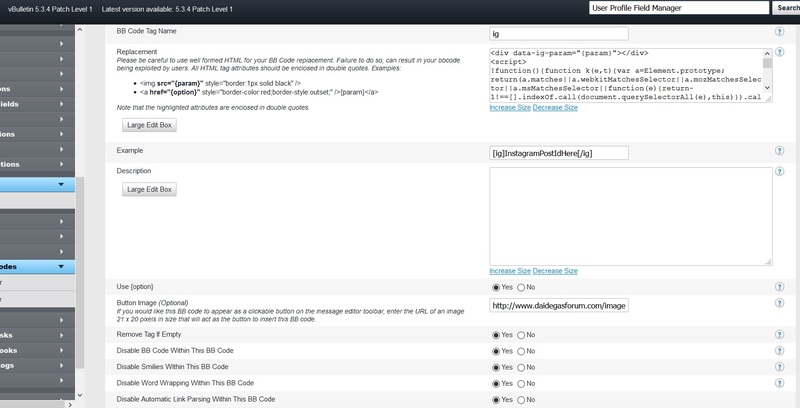 Instagram BBCode - vBulletin Mods That Rock! 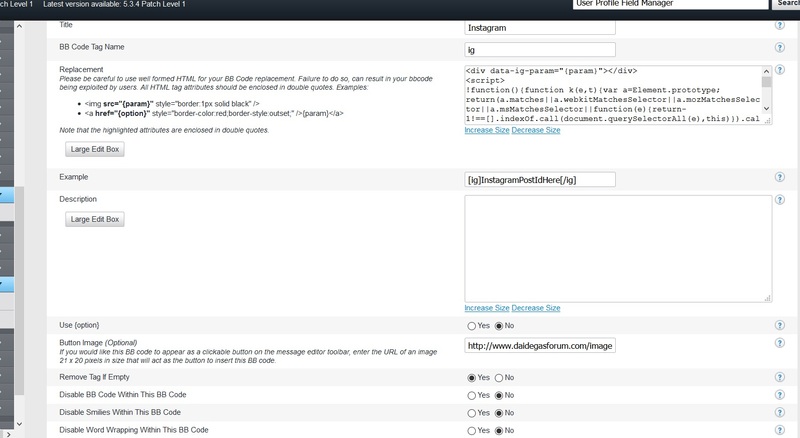 One way to integrate social media with forums is to embed posts from Instagram into forum posts. The updated code above does not support IE browser. If you care about IE, then add the below script tag in the head_include template for self-hosted version. For vBCloud owners, utilize the AdminCP > Settings > Options > Search Engine Tools > Google Ownership Verification HTML tag or Bing Ownership Verification HTML tag and paste the code there. Make sure the corresponding Enable Ownership Verification options is set to Yes. Button Image (optional): You could download this Instagram icon (right click and choose "Save image as...") and then upload to your server. Then specify the image path in this option. If specified, a new button for this BB Code will appear in the editor. I've implemented this on this site, See Instagram icon in the editor. NOTE: With the updated code, using the full Instagram URL is now also working. This also supports Instagram Video posts. And also Instagram Slideshow posts. Other sites may implement this same Instagram BBCode but the embedded Instagram post may not appear when reply is posted or when editing and saving or when previewing which is all done via AJAX. This version of mine works in those scenarios. Last edited by glennrocksvb; 01-05-2019, 10:46 PM. Please consider donating if you find this BBCode useful. any suggestions on what I'm doing wrong? I attached a screenshot. The code to instert is like this? Last edited by glennrocksvb; 11-25-2018, 03:21 AM. Did you put the correct Instagram post id inside the ig tag? Is "Allow BB Code" set to Yes in the Channel Manager for the corresponding forum channel? I have no idea why the [ig] tag is not parsed on your forum. Do you have other custom BBCodes and do they work? Or is it just the Instagram BBCode that is not working? But I do not want to define the height and width. This is my only option when I hit the three dots.. It's due to how iPhones apparently paste copied URLs as formatted hyperlinks without an option to paste as plain text like Android does.